The Marshall McLuhan Salon has the largest audiovisual archive about the Canadian media philosopher Herbert Marshall McLuhan outside of Canada, and will be open during the festival. 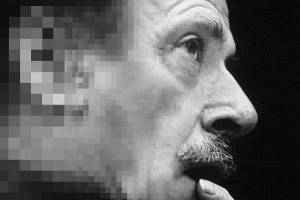 More information on the archive and the Marshall McLuhan centennial events. Find all available media on Marshall McLuhan in our Media Centre. transmediale and the Marshall McLuhan Salon of the Embassy of Canada present a new edition of the discussion series McLuminations, “Counter-Environment - Infrastructures and Substrata of the Global Village”, moderated by Baruch Gottlieb and featuring the transmediale 2014 residency artists Jamie Allen and David Gauthier. The Marshall McLuhan Salon has the largest audiovisual archive about the media philosopher Herbert Marshall McLuhan outside of Canada, and will be open during the festival. McLuminations 14:1 is a cooperation between transmediale and the Marshall McLuhan Salon of the Embassy of Canada in Berlin. The event is in English, admission is free. Please register below. In the Similkameen explores an idyllic white church located on the Upper Similkameen Reserve and the land around it long enough to place it, to learn its history and to meet its present while confronting the conflicted position of the church on First Nations reserves in Canada. It’s a highly personal undertaking for Hagan, who, since obtaining his Métis citizenship, has struggled to reconcile his suburban Christian upbringing with the blighted history of the church in Indigenous communities. The Métis filmmaker Tyler Hagan was born in Vancouver, Canada in 1986. He received his BFA in film from Simon Fraser University, where he co-founded the filmmaking collective Shakey Films. He lives and works in Vancouver. Canada, 2013, interactive web documentary, single-channel video loop, photographic prints . Similkameen Crossroads is produced by Jennifer Moss, Dana Dansereau and the NFB Digital Studio. Executive producer: Loc Dao. Admission is free. Please allow sufficient time for Embassy security and be prepared to present a valid photo-ID at the door.